What can one say? How do you address madness and evil coming together to create such utter chaos and tragedy in the lives of innocent victims and their families? 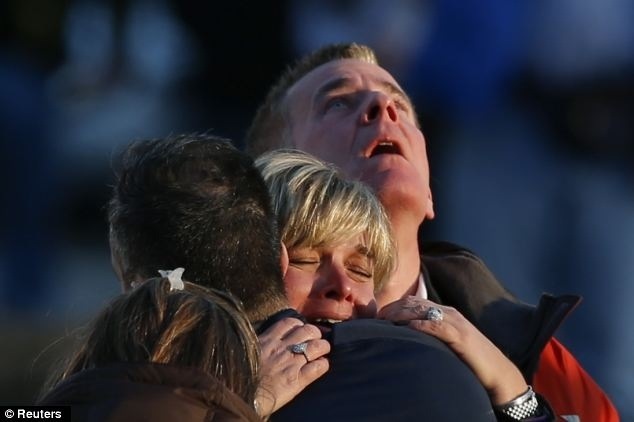 Like many of you, I have been immersed in the events unfolding via CNN in the wake of the horrendous killings at Sandy Hook Elementary School in Newtown, Connecticut. I am numb and shocked and angry and tearful. I am sure all of you share these emotions and hope that we can share our feelings and thoughts about the horrendous murders at Sandy Hook. We all know who the killer is, so you will not find his name in this article. What can we do? What can our government do? – Ban violent video games. Just totally ban them. For some people, their lives revolve around these games to the point that they cannot discern virtual life from reality. For many, especially those with fragile, fragmented minds, life is one big game, one sickening destructive game and, at some point, triggers a button that enable them to enact these games in real life. – Ban violence in the entertainment industry. Personally, I am sick of the violent lyrics in songs, the reenactment of those lyrics on stage, the gore and horror in the movies and television. Truly I could go on and on. And, for those who feel it is a free country, well, how free can we be if we are held victim because of this level of violence? – Advocate new laws into how mental illness is going to be addressed. Presently, severely mentally ill people are permitted to roam the streets simply because it is their right. Or they fall through the system. They are out of control, aimless, helpless, desperate, you name it. These people are very, very ill. It is not a physical illness like heart disease or cancer but, at the end of the day, it is a real illness that can negatively affect the lives of others. – Ban the guns. Who collects rifles? Who? And why? Is this necessary? Find another hobby. – Bullying at every level needs to stop – to the point where the person bullying face legal charges. It happens at school, in the work environment, on reality shows – it’s all around us and it is horrible, horrible, HORRIBLE. Since 9/11, we have been coping with the threat of terrorism throughout the world. It was a life-changing event in our lives where time stopped and hearts were overwhelmed with sadness, fear and helplessness. Changes need to be implemented – and now -for the world to evolve into a caring, nurturing and safe environment. May God Bless the precious, beautiful victims and their families. My heart and prayers go with you every day of my life. These were our babies…innocent little babies sitting in a classroom, my heart is breaking for the families of these children and the adults who lost their lives trying to protect these little ones!!! No words. Just prayers. Lots of them. Thanks for posting about the victims of the Sandy Hook tragedy. I agree that there are just no words. I’m very sad. So many lives affected. I keep seeing the face of little Emilie Parker, those beautiful blue eyes, the smile. It just doesn’t make any sense. Yes Darlene. Those eyes looking out at me from the TV set will haunt me for the rest of my life. Such a senseless, heart wrenching tragedy. Thanks for your comforting words. hildren, and also his interviews with the families. I hope you’ve been having a wonderful Christmas season. I’ve be back later I promise!! Hi Anita. I have missed you too! Nice to see you back here. Like you, I have been so disheartened and saddened and outraged by the Sandy Hook tragedy. Glued to CNN 24/7. Those reporters have been so brilliant, thorough and sensitive throughout this entire ordeal. When is the NRA going to wake up. When! Their answer is to put security personnel at every entrance of the schools throughout the nation? They never addressed the core issue- that these guns should be taken off the streets, that gone control protocol must be enforced, that mental illness must be addressed. However, I do agree that, until this is resolved, the country does need to reinforce the schools with security. We cannot tolerate anymore children dying in such a horrific way. It is disgusting and evil. Merry Christmas and a blessed, healthy and Happy New Year to you and your loved ones, Anita!! Rosanne-So many people are so disgusted with the NRA. One of the things not addressed was that that needs to be sufficient backround checks on every person applying for a gun. From what I’ve heard on CNN, 40% of gun sales in the country don’t even do backround checks. That is APPALLING, and so scary that the NRA thinks this is fine. Plus, they are denying the fact how dangerous assult rifles are. There was even a gun rights activist on Piers Morgan’s show who said that it looks like an assult rifle, but actually is a hunting rifle. I was stunned, and so angry at such blatant denial. These politicians need to stand up for what’s moral and right, and stope being afraid of the NRA. The memories of those beautiful children makes this cause extremely important, and so worth fighting for! Rosanne-Have a very Merry Christmas!! Oh Anita! I hear you. I cannot believe how ignorant and callous the NRA has been through this horrific tragedy. My heart breaks for these families. Here we are celebrating Christmas while knowing that for so many Christmas or their lives will never be the same. Prayers. God Bless you.